You are here: Home / Search results for "orgasmic cider company"
Ledbury Market House – Easter Show from Saturday 20 – 27 April 2019. The Herefordshire Guild of Craftsmen will be returning to the historic Market House in Ledbury for their annual Easter event. Showcasing the work by a dozen craftsmen, this show is the first outing of the year prior to the R.H.S.Spring garden show in early May. Learn more about the members of Herefordshire Guild of Craftsmen. Open daily 10am – 4.30pm Free Admission. Hergest Croft Spring Flower Fair is an auction and events in aid of St Micheal’s Hospice which helps people affected by terminal illness to live life to the fullest. Marches Makers Festival will be exhibiting local sculpture Over 40 plant and craft stalls from a wide range of local specialist nurseries. For more information visit www.hergest.co.uk/hergest Normal Admission prices apply. RHS Malvern is a fabulous Spring festival held at the Three Counties Showground. The show celebrates horticulture with designer show gardens, specialist nurseries, stands selling everything for the gardener, farmers markets with local produce, lectures by garden celebrities, vintage area, a vast flower marquee and the three guilds of craftsmen from Herefordshire, Gloucestershire and Worcestershire in the huge Wye Hall. Learn more about the members of Herefordshire Guild of Craftsmen. Hosted by the Royal Horticultural Society, Malvern Spring Festival is a worthy precursor to R.H.S Chelsea which follows this event a few weeks later. Entry prices and details about the RHS Spring Malvern show can be found here. The Ice Maiden Speaketh at Castle House Hotel in Hereford. Zanna Baker will talk about & show photos from her historic expedition Across Antartica. In January 2018, aged 29, Zanna Baker was one of the Ice Maiden team of 6 women that became the first all-female team to cross Antarctica unassisted, using muscle-power alone. Pulling sledges and battling temperatures of -50°C and wind speeds of over 60mph, the team completed the 1704km distance in just over 61 days – the first team to do the crossing with no prior polar experience. A Regional Advisor for the British Army, Zanna has travelled extensively and it was a two-month mountaineering and scientific expedition to South Georgia and the Falkland Islands with the British Exploring Society, when she was 18, that inspired her to try for the team. She says “Having never been the fittest or the fastest in life, I firmly believe that doing something extraordinary is possible for everyone, and that we should never underestimate our abilities”. Ticket: Talk and two-course dinner £40 W: castlehse.co.uk T: 01432 356321 Please note that booking is essential for all events at Castle House. Hay Festival is the literary highlight of the UK’s cultural calendar, bringing together the greatest writers, thinkers and performers of the moment in a vibrant exchange of ideas and celebration of creative work for all ages. Hay Festival celebrates great writing from poets and scientists, lyricists and comedians, novelists and environmentalists, and the power of great ideas to transform our way of thinking. The festival was founded around a kitchen table in 1987 and continues to attract the most exciting writers, filmmakers, comedians, politicians and musicians to inspire, delight and entertain. Find out more about the festival programme as detail is released and book tickets and how to get there at www.hayfestival.com. PRICES APPLY AT INDIVIDUAL EVENTS, PLEASE CHECK. The Herefordshire Guild of Craftsmen are showcasing their fantastic work at the iconic international at Hay Festival this year – for the first time on the main site. The members will be creating a vibrant emporium of design, artistry and skill for the duration of the Festival. Members taking part will be taking it in turns each day to steward and help with sales, commissions and enquiries. Learn more about the members of Herefordshire Guild of Craftsmen. More about Hay Festival. This years Wild Spring Feast is happening right in the middle of the hay harvest, and we’re setting up home aptly in the beautiful Hay Barn, at Home Farm Dulas and is full of history and stories of sweet harvests over the years. This years feast is gathered from the farm, using local flavours in global ways, it’s a celebration of our delicious, wild, world. After feasting there will be a treat of a concert from Nuadha Quartet, a collective of incredible musicians with Spanish, Moroccan, Brazilian and Celtic heritages – all of whom have made homes in the hay laden pastures of the area. We hope you can join us for this special celebration why it’s good to be local and global… Wild cocktails, canapes & 3 course meal followed by music from Nuadha Quartet. Please book via Foragefinefoods website. The 2019 Leominster Festival will take place on 6th-9th June in various venues around the town. Leominster Festival, run by a voluntary committee of local individuals since 1978 (first festival in 1980), is a well known and respected celebration of the Arts in rural Herefordshire. It seeks to engage and involve the whole community by bringing top quality performers right to the doorstep of the citizens of Leominster and beyond. 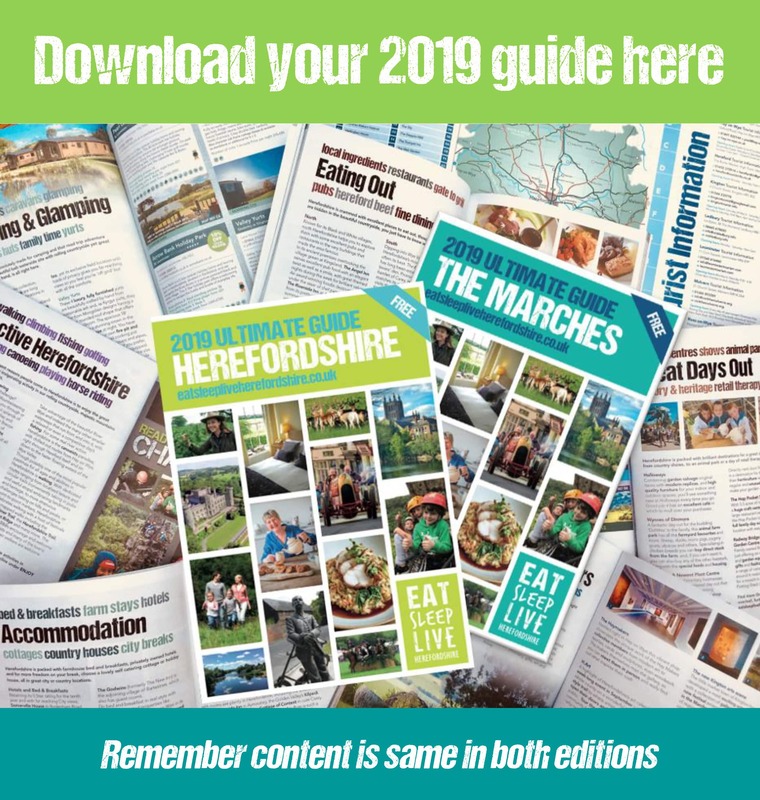 Every year the Festival provides an exciting, eclectic and varied programme of events across the Herefordshire Market town; including poetry, historic walks and talks, theatre, music, fine art and family fun. It also provides a platform for local community groups, charities and businesses to get involved with the Arts and engage with the wider community through a variety of free and ticketed events.Please see our “Events” for further details, more information is being added all the time. Follow the Facebook Page for details of individual events. 13C Forbury Chapel in Leominster Heritage Project Presents Hidden Heritage Family Walking Tours. Prepare to be shocked, amazed and fascinated by Leominster’s incredible history! Join walk leader, ‘Father Dennis’ to discover gruesome facts about Roger Cadwallador who was horribly executed in Leominster, see some incredible carvings, find out what the monks really got up to at The Priory, see hidden faces at the Forbury Chapel and learn how the town has changed over the centuries. Saturday 20th April 1.30 pm & 3pm – Departing Leominster Museum, Etnam St. Saturday 8th June 11.30am & 1.30pm – Leominster Festival Family Fun Day Departing Grange Court, Pinsley Road. Leomnster Every Friday throughout the summer holidays 11am & 1.30pm Starting July 26th Departing from the Forbury Chapel, Church St. The Herefordshire Guild of Craftsmen are showcasing their fantastic work at the Fantastic Royal Three Counties Show. The members of the Herefordshire Guild of Craftsmen can be found in the Severn Hall throughout the three day show. Learn more about the members of Herefordshire Guild of Craftsmen. A wonderful family show celebrating everything in the countryside with show cattle, sheep, pigs and goats, poultry marquees, tractors galore, a huge showring with events throughout the day, horse riding competition and farmers market. Find out about the Royal Show and entry prices.